I always like the spice powders which is being served in Andhra restaurants. At home, without a dollop of ghee and Dal powder my weekend meal never ends. 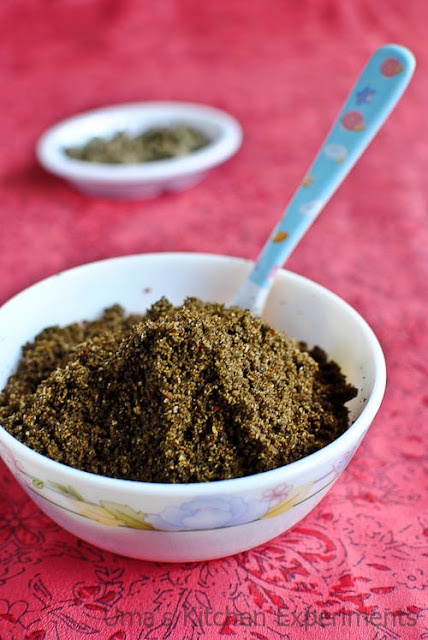 I always have Paruppu podi, Idly podi or Curry leaves podi at home to fulfill my craving. Sometimes, it is handy and helpful when you feel lazy to cook curries or gravies. Fine, When I came across this powder from Prathibha's place, immediately bookmarked it. 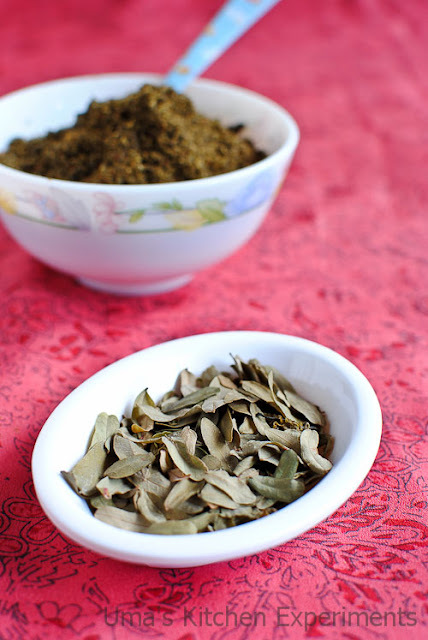 We get plenty of tamarind leaves at our native and during my mom's last visit here, I asked her to bring fresh, tender tamarind leaves and dried them here to prepare this powder. I prepared it in the night time and I served it for lunch on the following day. You don't believe it, the husband who is not fond of any spice powder also liked it and took some extra spoons while eating lunch. Also, I told the recipe to my mom and asked her to prepare it as she gets tamarind leaves in large quantities there. 1) Wash the tamarind leaves well and dry it in sun or under sunshade till it became crispy and dry. 2) Take a pan, dry roast the peanuts till the skin of it turns brown. Transfer to a plate. 3) In the same pan, dry roast sesame seeds. Transfer to the plate where we kept peanuts. 4) Dry roast the dry red chillies and then the grated coconut till it turns dry and slightly brown. Transfer to the plate. 5) Add a teaspoon of oil and add tamarind leaves. Fry till the leaves turns in its colour and became more crisp. Transfer to a plate and allow it to cool. 6) When it is cooling, peel the skin of the garlic and remove the skin of peanuts by rubbing it in between your hands. 7) When all the ingredients are cooled to room temperature, dry grind them to a fine powder. 8) Towards the end of grinding, add salt and garlic. Grind for a minute or till the garlic cloves crushes well. 9) Taste the salt and add more if required. 10) Cool the powder to room temperature. Store it in a dry, air tight container. Store it in refrigerator for longer shelf life. 1) Use only tender, fresh tamarind leaves. The dark green leaves and very tender leaves are not suitable for this powder. Dry them well before use. 2) Make sure the grated fresh coconut is moisture free after roasting, otherwise, simply go for dry coconut for long shelf life of the powder. Seriously wish i get these leaves here, such a beautiful podi. 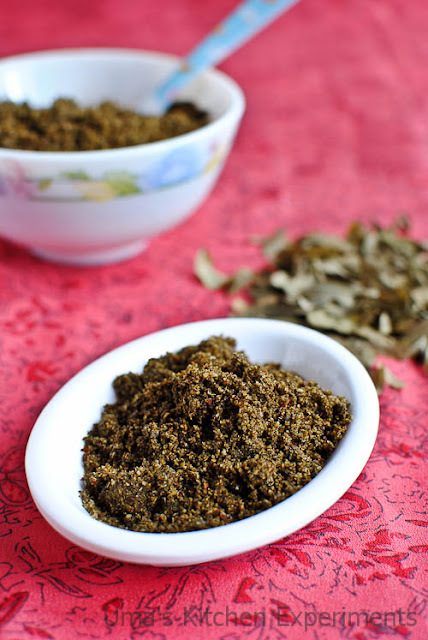 new recipe to me.. never thought we can use tamarind leaves..
very new and interesting podi Uma! kandippa try pannanum, good one! Unique one,Uma..haven't heard about this until u posted,useful one! never heard of this!looks nice! Tangy and mouthwatering.Never tried this one though we had lot of tamarind trees in our native place. Wow! I have not tasted this one before. I wish I had this leaves in new york drooling over the powder yummy. 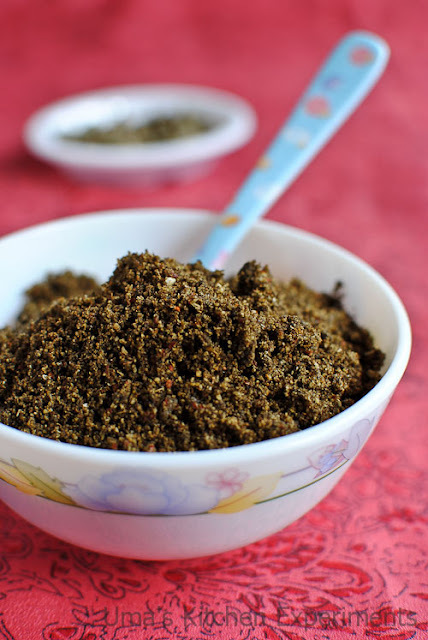 i never know we can do podi with tamarind leaves..awesome..
Lovely Post. Nice powder recipe too.love it..